Motor provides 100% of the lifting. Maintenance free 12 Volt rechargeable battery. Full range of models up to 1500 lbs. capacity. Some models include automatic load elevation. Reduces physical effort used to move heavy loads. Reduces the chance of personal injury. Increases job efficiency and productivity. Improves degree of customer service. Variable weight distribution to ensure well balanced controlled load. Loads are moved in a fraction of the time. Equipment pays for itself and increases profits. JUKE BOXES, VIDEO GAME MACHINES, DART GAME MACHINES, PINBALL MACHINES, SLOT MACHINES, MONEY CHANGERS, etc.. The PowerMate Motorized Electric Stairclimbing Handtruck is without question one of the most innovative products available today for the safe movement of heavy and awkward loads. This versatile equipment is four machines in one, mastering 100% of the lifting. The PowerMate Motorized Electric hand Truck has been widely used for many years for moving loads weighing up to 1500 lbs. PowerMate powers loads up and down stairs, on and off vehicles/loading docks, and across flat surfaces, while keeping the load in a well balanced position. It is powered by a completely sealed rechargeable battery. The PowerMate units are available in steel models for heavy weight lifting of loads up to 1500 lbs and in aluminum models for lightweight lifting of loads weighing up to 650 lbs. 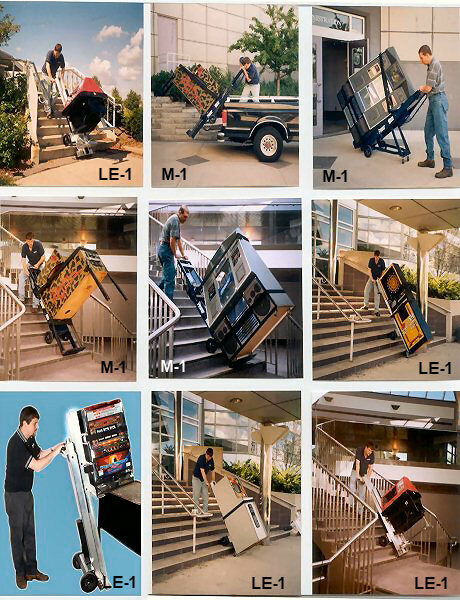 The PowerMate Motorized Electric Stairclimbing Hand Trucks are used by casinos and amusement parks to move such loads as slot machines, video game machines, ATM machines, etc. The PowerMate Motorized Electric Stairclimbing Hand Truck reduces the effort required to move heavy loads by over 87%, thus a two man job is easily moved by one man, and loads requiring four men can be easily handled by two. PowerMate reduces the risk of damage to walls, stairs, carpet and floors because the operator has 100% safe control of the load. PowerMate does 100% of the lifting of loads, which reduces the risk of back injuries and the resulting loss of productivity. When moving heavy loads on stairs, two operators can handle the load from above it, so that no one is in the danger zone below the load. PowerMate reduces the risk of products being damaged while on delivery, as well as, the resulting property damage, because PowerMate allows the operator to keep 100% control of the load. PowerMate cuts labor costs in half by reducing over 87% of the effort required to move heavy loads. PowerMate reduces the risk of back injuries and the resulting loss of productivity. PowerMate saves money and therefore puts more profits on the bottom line.